Editor's Note: This is the third article on famous Japanese Samurai leaders who, at the end of Japan’s feudal period, defied death and personal safety to help forge a new Japan. Prior articles included “Sakamoto Ryoma: The Indispensable Nobody” and "Katsu Kaishu: The Man Who Saved Early Modern Japan." Yoshida Torajiro (best known by his pen name Shoin), the subject of this article, was a principal intellectual protagonist of the Meiji Restoration of 1868 whose heroism and writings brought him much acclaim He was one among a group of Samurai leaders drawn from various clans whose beliefs, statesmanship and actions instigated dramatic changes in Japan following Commodore Perry’s naval intrusion -- the overthrow of the military government (1868), institution of a parliamentary government, and modernization – that virtually overnight turned a feudal society toward a progressive modern age. If the tenet of certain age-old philosophies is true that the physical environment at birth has an ominous effect on the future personality and life of the newborn child, then perhaps it was the sweltering heat of the Hagi [referring to the castle down of Hagi - ed.] summer that lit the flame of passion in Yoshida Shoin’s indomitable spirit for a new and stronger Japan — a passion which would neither be extinguished by the cold steel of the executioner’s sword some twenty-nine years later, nor by the passing of nearly one century and a half since his tragic death. For not only has Choshu’s [one of the principal military domains in feudal Japan - ed.] most beloved samurai been immortalized in the annals of Japanese history, but his spirit has been sanctified in numerous hagiographies [literally meaning the biography of of a Saint, but here used to refer to biographies of Shoin by others - ed.] his lofty aspirations recorded in copious biographies, his memory canonized in paintings and statuettes which to this day grace the alters of countless homes throughout the Yamaguchi countryside [the modern Yamaguchi prefecture that replaced the Choshu domian - ed.] where the charismatic genius came into this world. Yoshida Shoin was born the second son of a lower ranking samurai in the village of Matsumoto, amidst the verdant foothills of the castle town of Hagi, center of the great domain of Choshu, by the aquamarine Sea of Japan, in the eighth month of the first year of the Era of Heaven’s Protection — or more simply put, August 1830. Shoin’s motto and calligraphy, "Sincerity and perseverance always win," the dictum borrowed from the Chinese philosopher Mencius. “He knew nothing of anger,” a former student would recall. “He was kind to others… and had a polite manner of speech.” Yoshida Shoin was physically frail, soft-spoken and a master of self-control whose willpower knew no bounds. He was an avid scholar who denied himself sleep, and who was known to stand or walk in the snow to keep himself awake for his studies. At age five Shoin began the formal study of military tactics and the Chinese classics. By age eight he was studying the Confucian philosophy of Meng-tzu, and began attending the official college of the Choshu domain. In the following year he taught at the college. At age ten he won praise from the Lord of Choshu for his recital of the military classics. At fifteen he became awakened to the dangerous goings on in the world outside the sacred Empire of Yamato [Japan - ed.]. In 1848, five years before the arrival of Perry, he advised the Lord of Choshu to prepare for foreign invasion. In 1851, his twenty-first year, Shoin accompanied the Lord of Choshu to the Shogun’s capital at Edo [now Tokyo - ed. ], where he studied under Sakuma Shozan, the most celebrated Western military scientist in Japan. 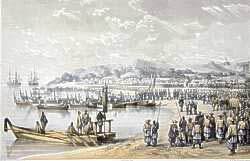 Shoin was in Edo when Commodore Matthew Perry of the United States Navy arrived in June 1853. Perry led a squadron of heavily armed warships into the bay off the Shogun’s [the military leader of Japan who was during this time the head of the Tokugawa clan - ed.] capital, demanding an end of Japanese isolation and inciting fifteen years of bloody turmoil throughout the island nation. Shoin learned from Shozan the futility of challenging the modern military power of the West with Japan’s ancient arts of war. He adopted his teacher’s belief in the aphorism “Know the enemy” in order to “control the barbarians through barbarian technology.” But the Tokugawa Shogunate did not have the wherewithal to reject Perry’s demands. Rather than remain idle while bumbling Tokugawa officials sealed the fate of the Japanese nation, Shoin, with the help of his revered teacher, planned drastic measures. Perry concluded Japan’s first treaty with the United States in March 1854. Shortly after, his squadron lay in the harbor at Shimoda, one of two ports opened under the terms of the treaty, from which it would soon depart. Refused by Perry, the two samurai were apprehended by the Japanese authorities, and confined to a cage. They nevertheless managed to relay a message to the Americans, “a remarkable specimen of philosophical resignation under circumstances which would have tried the stoicism of Cato…[the ancient Roman statesman and politician - ed. ]” The message begins: “When a hero fails in his purpose, his acts are then regarded as those of a villain and robber. In public have we been seized and pinioned and caged for many days… Therefore, looking up while yet we have nothing wherewith to reproach ourselves, it must now be seen whether a hero will prove himself to be one indeed.” Shoin’s heroics would become self-evident soon enough, but first he would be transported to the jail in Edo, and returned as a prisoner to Hagi. In summer 1856, American envoy Townsend Harris of the United States established the first American Consulate in Japan at a Buddhist temple in Shimoda to negotiate Japan’s first commercial treaty. Protocol demanded that the shogunate could only sign a treaty after receiving permission from the Imperial Court at Kyoto. As a commercial treaty with the United States materialized, opposition grew among proponents of Expelling the Barbarians, who now rallied around the Kyoto court. These xenophobes called themselves Imperial Loyalists. Pitted against them were the proponents of Opening the Country, led by Ii Naosuke, the powerful Lord of Hikone [the feudal domain - ed.]. Japan split into two factions. The Loyalists claimed that the Shogun was merely an Imperial agent, who at the beginning of the seventeenth century had been commissioned by the Emperor to protect Japan from foreign invasion. They claimed that true political authority rested with the Emperor, and that the Tokugawa could only justify its rule by expelling the foreigners. They argued that since the Shogun was no longer capable of fulfilling this ancient duty, the Emperor and his court must be restored to power to save the nation. As a result, the national government developed into a twofold structure: while the shogunate continued to rule at Edo, the Imperial Court was undergoing a political renaissance in its ancient capital at Kyoto. When the Edo authorities petitioned Kyoto to sanction the commercial treaty, they were flatly refused. In April 1858, Ii Naosuke was appointed Tokugawa Regent, making him head of the Shogun’s council and arbitrary ruler of the military government. In June Regent Ii realized a commercial treaty with the United States without Imperial sanction, and pandemonium ensued. After spending over a year in prison, Shoin was placed under house confinement. In November 1857, he established his progressive Sho-ka-son-juku – Village School Under the Pines – and thereby secured his place in Japanese history. Once the will is resolved, one’s spirit is strengthened. Even a peasant s will is hard to deny, but a samurai of resolute will can sway ten thou­sand men. Life and death, union and separation, follow hard upon one another. Nothing is steadfast but the will, nothing endures but one’s achieve­ments. These alone count in life. To consider oneself different from ordinary men is wrong. As samurai throughout Japan ranted and raved and vowed to kill the “traitors” who had opened the country to the “barbarians,” Yoshida Shoin preached Imperial Loyalism to young men of the lower rungs of Choshu society at his academy in Hagi. He professed that the Emperor was the true sovereign of Japan. He opened his pupils’ eyes to the dangerous situation of the world outside. But Master Shoin nevertheless supported Tokugawa rule, and favored Opening the Country to enrich the nation and develop a strong military. He advocated a union between Kyoto and Edo to protect Japan from the threat of foreign subjugation. These ideas he instilled in the minds of his young disciples. And he was only twenty-seven years old. And he was very successful, for among his disciples were future leaders of the revolution which was the Meiji Restoration, including two prime ministers. No sooner had Shoin heard the news of Ii’s “blasphemy,” than he made a complete turnabout in his political stance, and became the most radical of zealots who preached Imperial Reverence and Expelling the Barbarians. He would now “correct” the lese majesty [affront to the Emperor - ed.] committed by the evil regent. He would take part in a plot among radicals from other clans to assassinate him, but first, in November 1858, he planned to assassinate a Tokugawa councilor whom Ii had unsuccessfully sent to Kyoto to obtain Imperial sanction for the commercial treaty. Shoin’s plan was never realized, for it was determined by the Choshu authorities that his radicalism threatened the well-being of their daimyo (the military leader of their domain). In December Shoin was again imprisoned in Hagi. But he would not compromise his ideals, and from his cell became more and more defiant. “I am sorry to say,” he wrote to a friend, “but I have no use for the Imperial Court, the shogunate, or our clan. The only thing I need is…my own meager body.” If neither Edo, Kyoto or Choshu would take the appropriate measures, then this archetype of Japanese revolutionaries would. The revolution he envisioned would be accomplished through the cooperation of lower ranking samurai and men from the peasant and merchant classes. The notion was preposterous in 1858, but more prophetic perhaps than even Shoin imagined. Shoin would not live to see the revolution unfold. In the following May Choshu received orders from the shogunate to send its most dangerous insurgent to Edo. Shoin reached Edo in June, was imprisoned there in July. He was questioned by the authorities, who were amazed by his confessions. Defiant as ever and determined to set the authorities on the proper course, Shoin not only openly expressed his disdain for the dictatorship of Regent Ii and his suppression of the Loyalists, but he took it upon himself to divulge his assassination plans. Although Shoin’s confession had sealed his fate, even now he did not expect to die. He was too occupied planning the revolution. What’s more, his assassination plans had never been realized, and his confession had been voluntary. “I don’t know what my punishment will be, but I don’t think it will be execution,” he wrote to his family in June. It wasn't until mid-October, when three of his comrades were executed, that Shoin realized his end was near. On October 15 he wrote a death poem. Two days later he was informed of his death sentence. He was brought to an open courtyard adjacent to the prison, and led to the scaffold. With perfect composure he kneeled atop a straw mat, beyond which was a rectangular hole dug in the rich, dark earth to absorb the blood. Standing nearby was the executioner, Yamada Asaemon, his long and short swords stuck through the sash at his left hip. Asaemon, who beheaded thousands during his long, illustrious career, was duly impressed by Shoin. “Yoshida Shoin died a truly noble death,” he would tell his son. Shoin calmly straightened his clothes. He asked for a piece of tissue paper to clear his nasal passage, then recited his final death poem: “Parental love exceeds one’s love for his parents. How will they take the tidings of today?” The executioner now drew his long sword, and with one clean stroke severed the head of the archetype of Japanese revolutionaries. (a) Leadership quotes by YOSHIDA SHOIN. Source: Sources Of Japanese Tradition, Columbia University Press. (b) Shoin’s motto is reproduced with permission of The Gardener: Louis Chor - http://www.ualberta.ca/~chor/sincere.htm. (c) The image of Perry’s delegation first landing on Japnanese soil is from a collection of sepia toned stone lithograph plates from the original “Narrative Of An Expedition Of An American Squadron To The China Seas And Japan” provided complements of Kauai Fine Arts located in Lawai, Hawaii. (e) Image of by Ii Naosuke is a FightingArt rendering of a woodcut image. This article originally appeared in the Autumn 2002 issue of Tokyo Journal. Posted With Permission of the author. Romulus Hillsborough is a native Californian who lived in Japan for sixteen years, studying the language, history and culture. He is the author of RYOMA - Life of a Renaissance Samurai(Ridgeback Press, 1999) and Samurai Sketches: From the Bloody Final Years of the Shogun (Ridgeback Press, 2001). RYOMA is the only biographical novel of Sakamoto Ryoma in the English language. Samurai Sketches is a collection of historical sketches, never before presented in English, depicting men and events during the revolutionary years of mid-19th century Japan. Reviews and more information about these books are available from Ridgeback Press. Also see the Samurai History Tour at http://www.ridgebackpress.com/tour.htm.